Flexibility is currently a fashionable concept used in different ways and for different purposes, and it is a term which is much in use in both political and organisational circles. But what does it mean? How is it put into effect? This special edition of the European Journal of Work and Organizational Psychology addresses these questions in the macro context of the labour market as a whole, but especially at the workplace. It looks at the different types of flexible work arrangement and their incidence across Europe. It considers the motivation of management in introducing these ideas and how the regulatory, and cultural, environment within their country affects employer decisions. Employers also have to respond to the constant flux of economic conditions and the competitive state of the market. Another significant factor in their behaviour is technology, which together with these business pressures, is driving organisations to adopt ever more flexible ways of working. We have one chapter that examines this changing world of work. But what of employees? They have their own interest in flexibility - to match lifestyle preferences and to meet domestic responsibilities. However, though some employers try to accommodate these aspirations, often flexibility is enforced rather than embraced. One of the journal articles suggests a means by which flexibility can be negotiated to meet mutual needs. 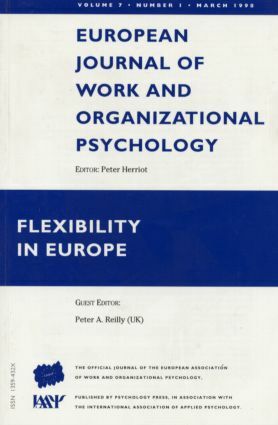 The journal addresses such issues as whether flexibility is a peculiarly Anglo-American project, made possible through deregulation of the labour market, or whether it exists in different forms but to a comparable extent in other parts of Europe. What are the conflicts between governmental regulation of the labour market in such countries as Germany and France and organisations' (especially multinational organizations) desires for greater flexibility? What are the implications of flexible contracts for Human Resource Management? What are its likely effects on employee morale and organisational commitment? What new HR knowledge, skills, and processes are required? What are the cultural differences across Europe that will profoundly affect the nature of the answers to these questions? P.A. Reilly, Introduction: Flexibility for the Individual, Organization and Society. P.A. Reilly, Balancing Flexibility - Meeting the Interests of Employer and Employee. A. Jenkins, Flexibility, "Individualization", and Employment Insecurity in France. K. Purcell, J. Purcell, In-sourcing, Outsourcing and the Growth of Contingent Labour as Evidence of Flexible Employment Strategies. O. Tregaskis, C. Brewster, L. Mayne, A. Hegewisch, Flexible Working in Europe: The Evidence and the Implications. P. Sparrow, The Pursuit of Multiple and Parallel Organizational Flexibilities: Reconstituting Jobs.